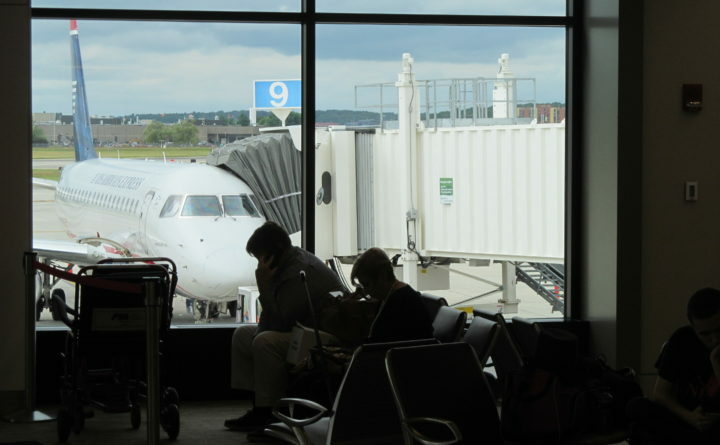 Passengers wait to board their flights at Portland International Jetport in this 2013 BDN file photo. As the federal government shutdown continues, the union that represents 25 air traffic controllers at the Portland International Jetport says the long-term impacts could be serious. Mick Devine, the New England vice president of the National Air Traffic Controllers Association, said some controllers who work in Portland have already been sent back from training at the Federal Aviation Academy in Oklahoma, which is closed during the shutdown. “So, at some point when the government reopens and they’re able to get the academy back open, they’re going to have to start from scratch, or from weeks behind where they ended, to catch themselves back up,” Devine said. The union says the industry is facing a major staffing crisis, with the number of air traffic controllers at a 30-year low. “With the academy shut down now, we’re going to start to feel this, in terms of further exacerbating staffing, in the months and years ahead,” Devine said. Right now, Devine said, five of the jetport’s controllers are on furlough; the others are working without receiving a paycheck. Older controllers who aren’t getting paid under the shutdown may just retire, he said, and younger controllers might decide to look for work in another industry. And he said for travelers, this could all mean delays. “We’re not going to have the staffing to keep up with the volume of traffic, so what we’ll end up doing is putting in restrictions for the amount of traffic that runs through the system,” he said. Devine said there’s no point at which the staffing issue would become a danger for travelers.